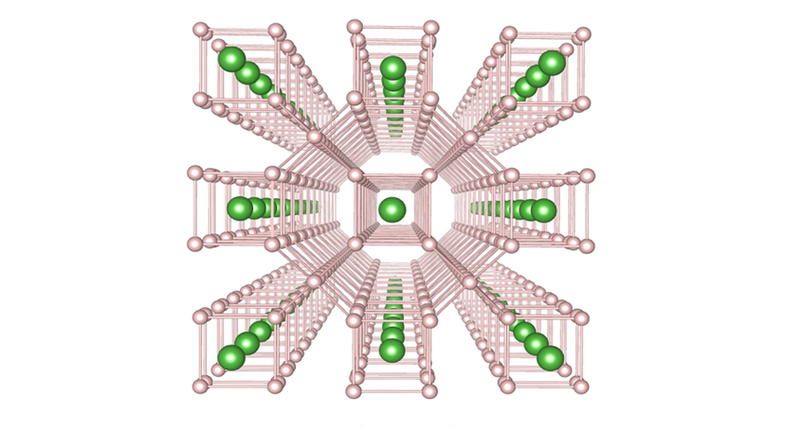 HELLA HYDROGEN The compound LaH10 is composed of 10 hydrogen atoms (pink) for each lanthanum atom (green). This hydrogen-rich material was predicted to exhibit superconductivity, evidence for which has now been found. Superconductors are heating up, and a world record-holder may have just been dethroned. Two studies report evidence of superconductivity - the transmission of electricity without resistance - at temperatures higher than seen before. The effect appears in compounds of lanthanum and hydrogen squeezed to extremely high pressures. All known superconductors must be chilled to function, which makes them difficult to use in real-world applications. If scientists found a superconductor that worked at room temperature, the material could be integrated into electronic devices and transmission wires, potentially saving vast amounts of energy currently lost to electrical resistance. So scientists are constantly on the lookout for higher-temperature superconductors. The current record-holder, hydrogen sulfide, which also must be compressed, works below 203 kelvins, or about −70° Celsius (SN: 12/26/15, p. 25). The new evidence for superconductivity is based on a dramatic drop in the resistance of the lanthanum-hydrogen compounds when cooled below a certain temperature. One team of physicists found that their compound's resistance plummeted at a temperature of 260 kelvins (-130 C), the temperature of a very cold winter day. The purported superconductivity occurred when the material had been crushed with almost 2 million times the pressure of Earth's atmosphere by squeezing it between two diamonds. Some samples even showed signs of superconductivity at higher temperatures, up to 280 kelvins (about 7 0 C), physicist Russell Hemley of George Washington University in Washington, D.C., and colleagues report in a study posted online August 23 at arXiv.org. Hemley first reported signs of the compound's superconductivity in May in Madrid at a symposium on superconductivity and pressure. Another group found evidence of superconductivity in a lanthanum-hydrogen compound under chillier, but still record-breaking, conditions. The researchers crushed lanthanum and hydrogen in a diamond press to about 1.5 million times Earth's atmospheric pressure. When cooled to about 215 kelvins (-580 C), the compound's resistance falls sharply, physicist Mikhail Eremets of the Max Planck Institute for Chemistry in Mainz and colleagues report in a paper posted online August 21 at arXiv.org. It's not clear what the exact structures of the chemical compounds are and whether the two groups are studying identical materials. Differences between the two teams' samples might explain the temperature discrepancy. By scattering X-rays from the compound, Hemley and colleagues showed that the material's structure was consistent with LaH10, which contains 10 hydrogen atoms for every lanthanum atom. Hemley's team had previously predicted that LaH10 would be superconducting at a relatively high temperature.